Upcoming Games: The Doctor Is Out! Another quick local game announcement for SE Michigan Clix’ers!! This week at Comics & More in Madison Heights, we will be playing Week 3 of our custom “Dark Dimensions” series! In Week 1, we played “A Guy With a Plan.” For week 2 of our Dark Dimensions Series, we ran a new, completely original scenario called “Omega Level Override,” based on Mark Waid’s continuing S.H.I.E.L.D. run. Coulson’s ongoing investigation into the activities of Mys-Tech and the identity of their mysterious benefactor leads him to consult the world’s foremost expert on the arcane–Doctor Strange! Unfortunately, the doctor is not at home–and Mys-Tech seems all too aware, as they’ve taken this opportunity to break-in to Strange’s Sanctum Sanctorum in order to steal the ancient and powerful Book of Morphesti! 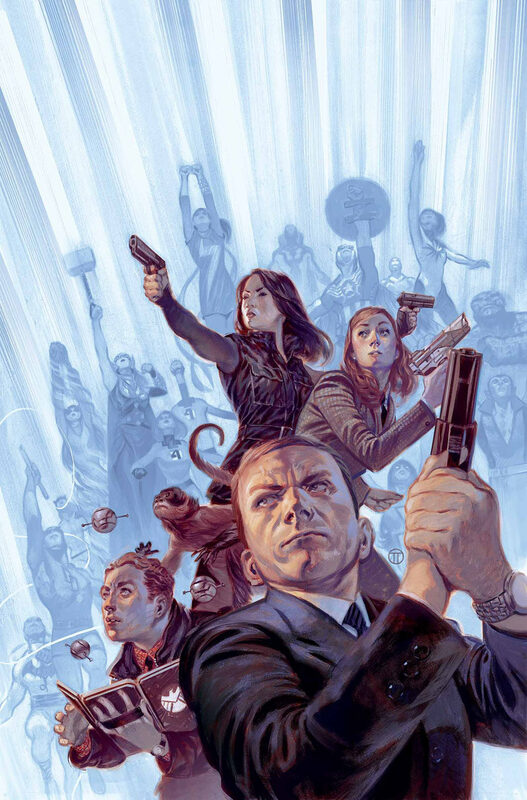 If Coulson wants any answers, he’s going to have to stop Mys-Tech’s agents and recover The Book before someone accidentally unleashes an apocalypse! But just getting to the ancient tome is going to be a challenge. Coulson knows as much as anybody that traversing the Sanctum Sanctorum without a mystically-inclined guide is dangerous business. The Build Rules: You must choose to play as one of two factions: S.H.I.E.L.D. or Mys-Tech. Each faction has their own benefits and restrictions, as outlined below. Regardless of which faction you choose, your team must be a 400 Point Themed Team, and all the figures must be both Marvel and Modern Age. The Mystical Guide: Traversing the Sanctum Sanctorum without a mystic is hazardous to your health… and your Clix! Therefore, when you build your force, you must include a Modern Age Marvel character with the Mystical keyword. That character has your faction’s keyword (either S.H.I.E.L.D. or Mys-Tech) this game. –This scenario will be played on the “Doctor Strange Mansion” Indoor Map from Amazing Spider-Man. The winner of the Map Roll may choose to either go first OR choose which side of the Map they’d like to start on. –If your Mystical Guide has been KO’d, any time a friendly character enters Hindering Terrain for any reason (Movement, Knockback, etc. ), roll a d6. On a result of 1-3, deal that character 1 unavoidable damage and then place that character in an adjacent square of clear terrain. -Relics, ATA’s, Team Bases, Avengers ID Cards, Resources and Bystander/Horde Tokens are NOT allowed as part of your Build UNLESS they are specifically allowed by your faction or brought into play via a Trait or ability possessed by a member of your team. –-If you choose to play as S.H.I.E.L.D. : You must play a S.H.I.E.L.D. Themed Team. You may include the S.H.I.E.L.D. ATA and/or up to 3 Avengers ID Cards in your Build by paying their normal costs. —If you choose to play as Mys-Tech: You must play a Themed Team, but you may NOT include any character with the S.H.I.E.L.D. or Avengers keyword. (You are encouraged to choose a team of “villainous” characters, but it is not a requirement). If one or more characters on your team has an available ATA for one of their keywords, you may include that ATA in your Build by paying all applicable costs. During Force Construction, all characters on your team gain the Mys-Tech keyword. The Cost: To enter this week’s game, the cost is $5. The Prize: Winner and Fellowship will both receive wkM15-011 Doctor Strange!! Okay! That about covers it! Feel free to post any scenario questions in the Comments, and I’ll answer them as soon as I can. Until then, Stay Safe, and Watch Where You Draw Your Lines of Fire!